If you're anything like us, you'll admit to finding houses with garden paths ridiculously enchanting. Perhaps it's all those fairy tales we used to devour… Well, whatever the reason, there's something undeniably charming about a well-kept path leading to an inviting home. It somehow adds a magic touch, as well as being a necessary practical feature. Wooden steps are used to cross the garden to get to the front entrance of the house. The beauty of the timber materials is highlighted by the spotlights on the way and in the bushes around the garden. It is well-designed and exudes an atmosphere of relaxation and peace—what many of us look forward to when coming home! homify is a cornucopia of established and incredible professionals and projects, and this one is no exception. In this photo, for example, the entrance to the house was designed with the presence of warming floor lights and curved paths, bringing movement and delicacy to the gorgeous design. When they are used well, geometric designs can create wonderful results. 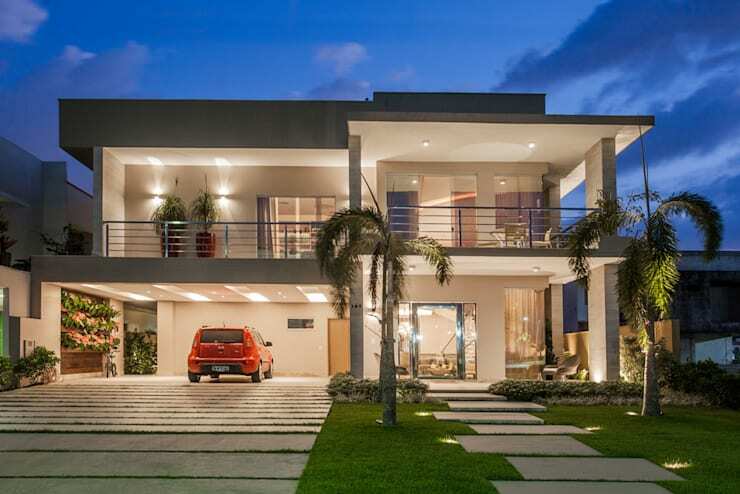 Here, this modern house seems cut into to make the angles and squareness and serves as a great inspiration when using concrete and rectangular structures. 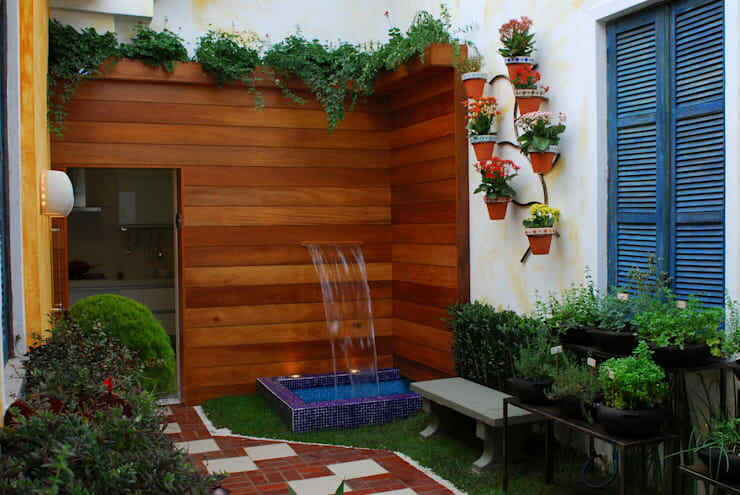 Water features bring harmony and elegance to the home. In this gorgeous design, a small wooden footbridge over the reflecting pool illuminates the water outside of this simply spectacular home. That feeling of crossing a bridge to get home is perfectly whimsical. Speaking of lighting, the idea of using LED lamps on the steps leading to the main entrance makes the whole experience even more magical. 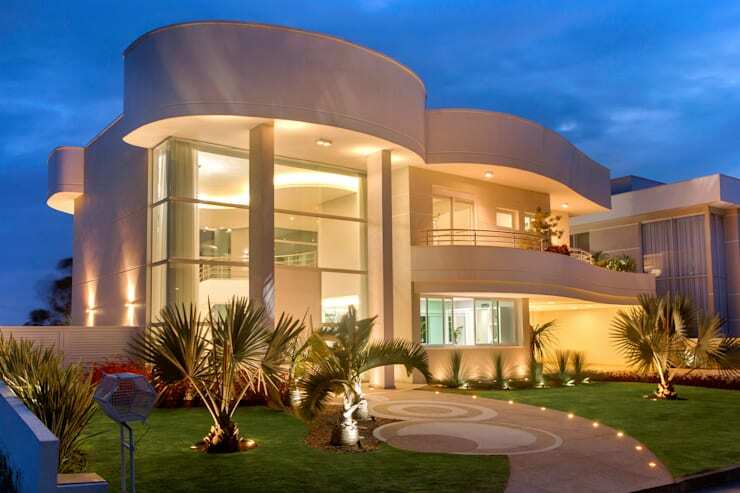 The details enhance the look of the beautifully modern facade. The delightful simplicity of this design's every little detail is just incredible. The contrast of the upper block smooth wall with the wooden vertical lines on the bottom floor is stunning and also reflects the landscape around it. Marking the way to the door is a delicate staircase made of concrete slabs in rectangular shapes with warm spotlighting from the ground. No extras and no fuss! 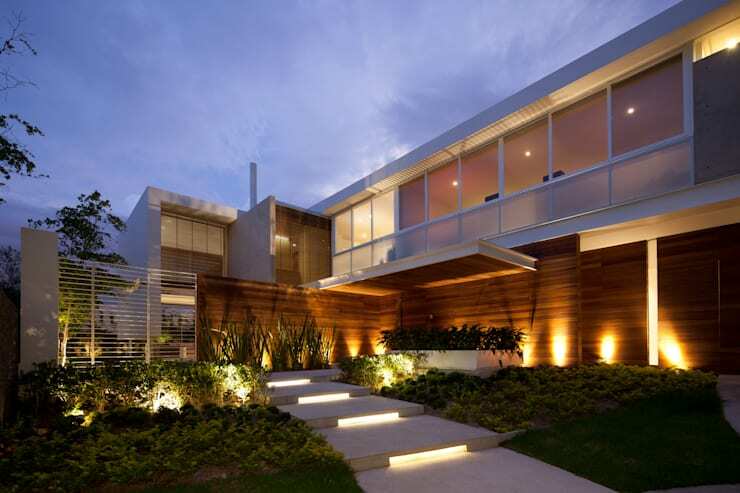 For modern projects like this, fixtures on the ground such as lights composes the whole picture perfectly. Small points of light illuminate the wide steps up to the house while, from the sides, indirect light from amongst the plants and bushes has a beautiful, welcoming effect to the facade. 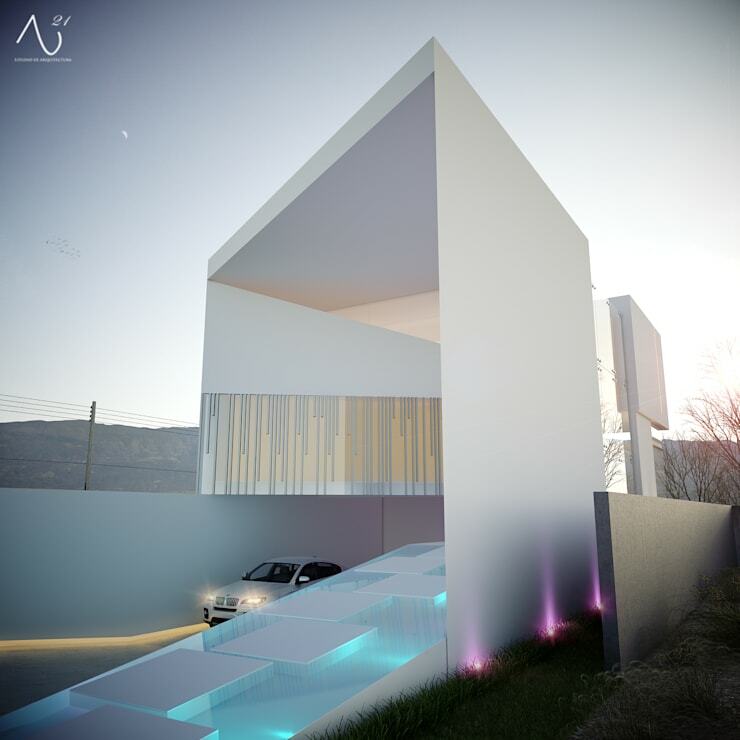 LED lights give you the opportunity to play around with colours and intensities; these new possibilities bring new energy to enhance your entrance. Blue and pink are cheery and make you happy to be going home! 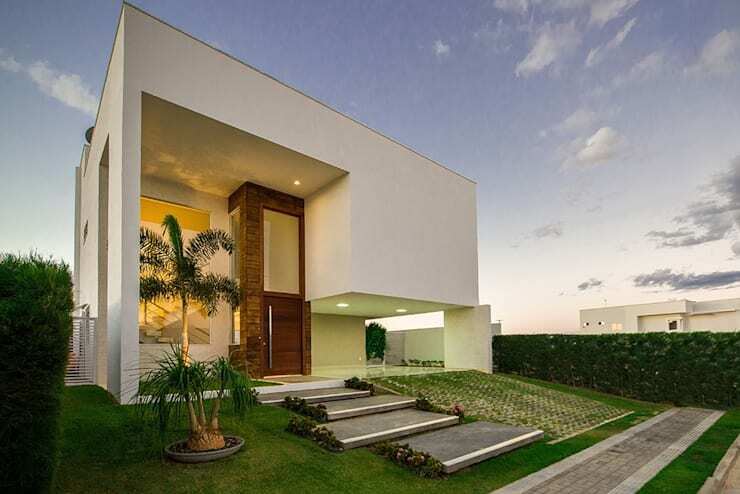 Modern blocks with large and bright lines added to the delicate front garden complete this simply lovely minimalist design. 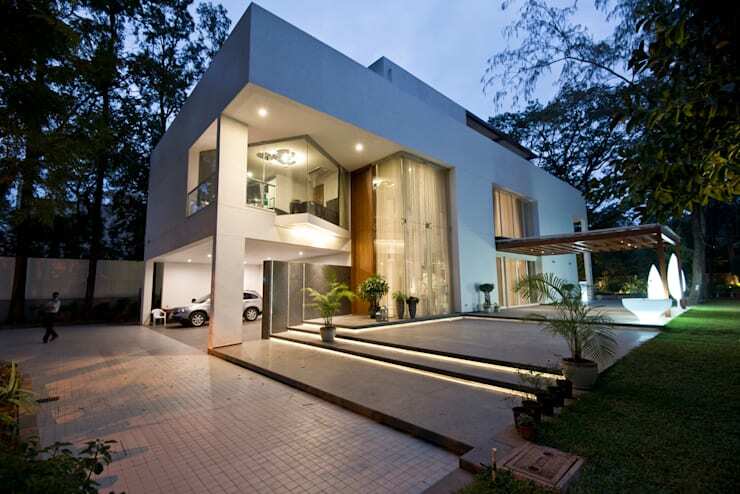 The presence of concrete slabs on the lawn further enhances the natural climate of surrounding space, too. 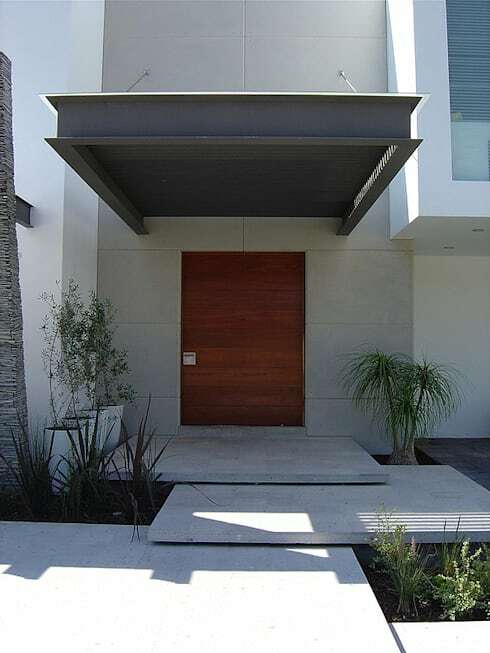 A well designed entrance like this one often integrates into its landscape to embrace the beauty of the facade. This staircase leads the way up to the entrance and follows the broad lines of the main block of the house, so you get a good view of it when you're walking up to the door. 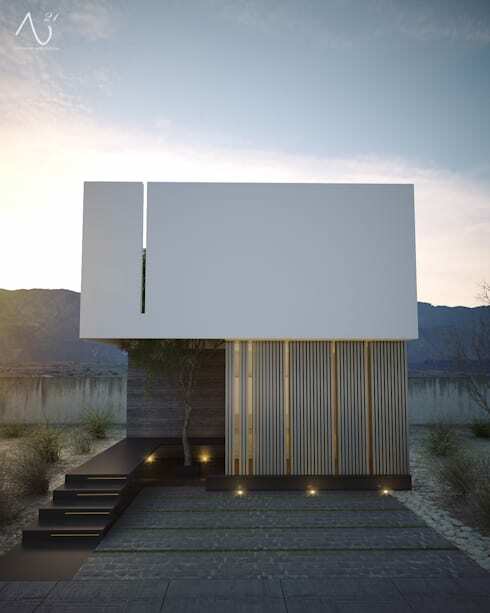 The overlapping stone plates that mark the entrance of this home are enough to bring bags of modernity and elegance. The use of a perfectly-centered sizeable wooden door and the protection of steel coverage complements the strong personality of the house. 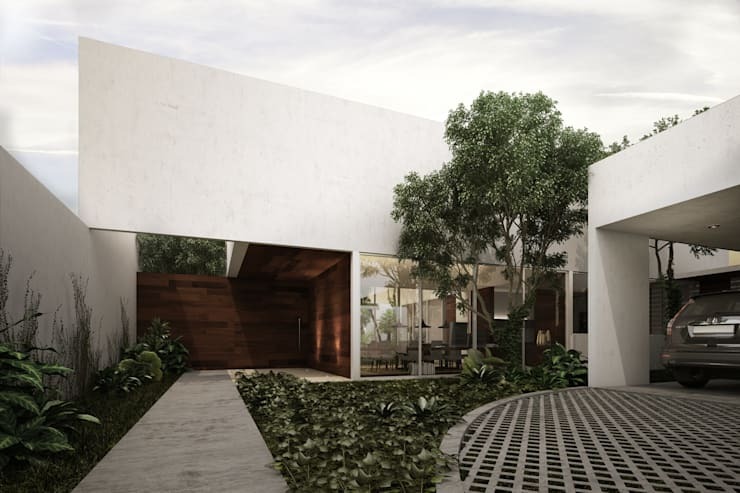 The expansive lawn houses the slightly staggered concrete slabs that pave the way to the front entrance. 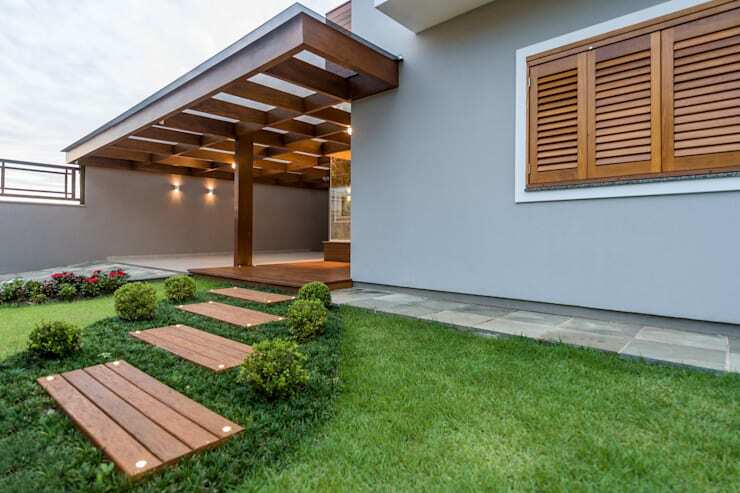 This simplicity is beautiful and uses a shared space in the front garden and frames the delicate home perfectly. This entrance and its pathway are both made from all natural materials: stone, wood, plants and trees. Framed by the greenery and plant life, the pathway feels cosy and as if you're right in the middle of a forest. For those of us who love the company of plants and garden life, this is undoubtedly the best inspiration! 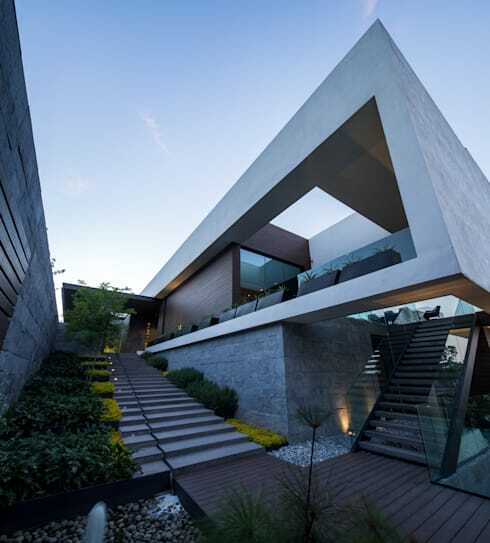 Finally, we come to this facade with intriguing geometric shapes and sweeping curved lines. In this project, we can see the beautiful result of an elongated path and the curved area framing the plants' space. 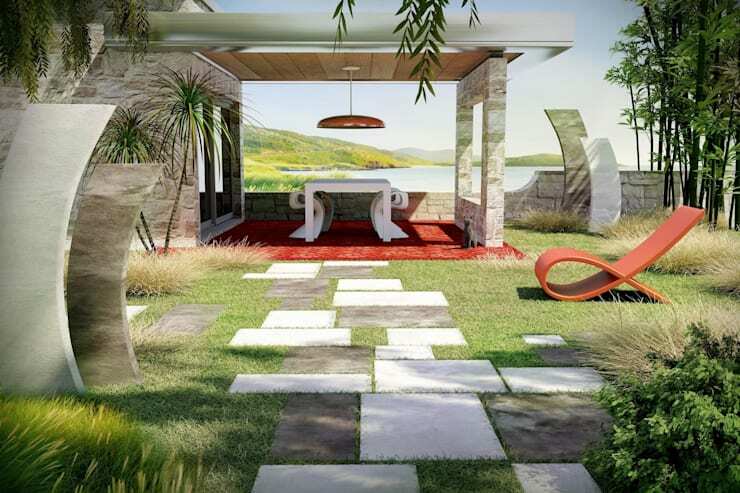 Also bordering both spaces, an abundant garden brings elegance to the environment. 15. 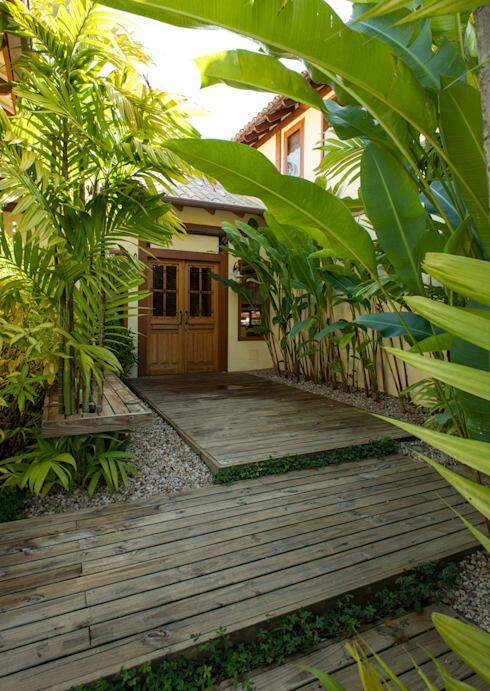 The way to paradise -- your patio! Which of these path designs would you choose?